1. We commonly hear this phase " A picture paints a thousand words ". The author recently purchased a Sony Digital Camera for the purpose of providing "Picture Tours". All photographs are not more than 200 pixels by 150 pixels to optimize speed of downloading at your end. 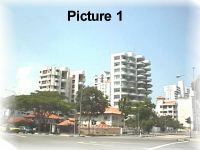 For privacy, the exact location of such houses are not revealed. The purpose of these tours is to aid you further in better understanding Feng Shui concepts and how they are applied. 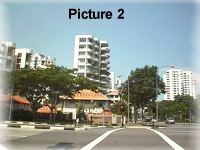 All the pictures you see are taken in Singapore unless stated otherwise. 2. It is expected that you should already know some basic Feng Shui concepts before reading these " Photo Tours ". 3. As this is a new addition, these pages are expected to grow. For the moment, please be patient as the author has yet to tour the entire island (referring to Singapore Island). 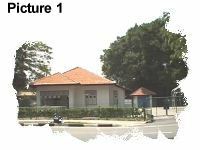 If you are in Singapore and happen to notice this `guy' walking around outside your foot-paths or walkways taking pictures of buildings etc. it could be me! Erh.. please don't call the police! Besides getting a good exercise, we get to learn Feng Shui `first hand'. Cheers! 4. If you would like to contribute any pictures (royalty free) which you would like to share with the rest of your internet friends, feel free to send it as an attachment and your comments to the author's e-mail address the Author. Thanks in advance! 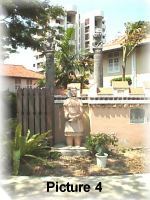 Notice that the owner placed a `Chinese warrior" with two tall lion statues to guard the back portion of the house? 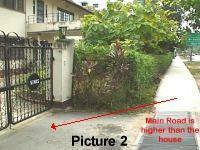 Is the owner is trying to protect his house from `adverse sha' coming from the main road intersection? 5. Picture 5 shows the same house but from the front. Do you see two "Chinese warriors" guarding both sides of the main gate? 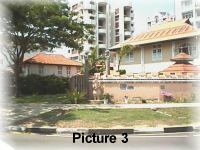 On the left, the owner planted a few trees to shield the left side of the house which has a main road running parallel beside it. 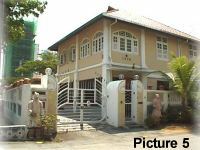 An old refurbished bungalow that was built under Feng Shui concepts. 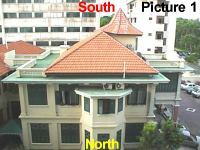 Picture 1 shows the North/South direction of the house. If you look carefully the North, has a shape of one-half of a trigram and the toilet is at this location for both the ground floor and first floor of the house. For information, North belongs to the water element. At the South, you will notice a pointed octagon roof. 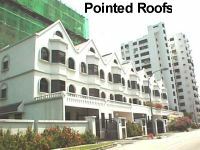 A pointed roof represents the Fire element. Picture 2 shows another view of the house taken at another angle. 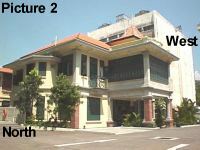 Notice that the `Western' part of the house has a flat shaped structure. This represents the `earth' element. Isn't this a perfect example of house applying Feng Shui concepts. No wonder, it still remains today and the government has earmarked the building for conservation and it cannot be demolised!